When Snapchat’s geofilters came out in December 2014, they were mainly used to add fun, location-specific designs on top of photos. Since then, brands like IHOP and MasterCard have used the community-driven filters to target consumers. Now, an ad agency has a new approach. Digital shop space150 calls itself the "agency of the next five years" and claims to be the first to use the geofilters in a particular way — to hunt for potential interns. (Snapchat could not be reached to confirm this statement.) By targeting libraries and common areas on college campuses, and local hotspots like the Venice Skate Park in Los Angeles, space150 hopes to recruit socially engaged candidates for 10 open intern positions in its New York, Minneapolis, Burbank and Los Angeles offices. Space150 was able to use Snapchat’s self-service tool to create its own unique geofilters that add some personality to the recruiting process. 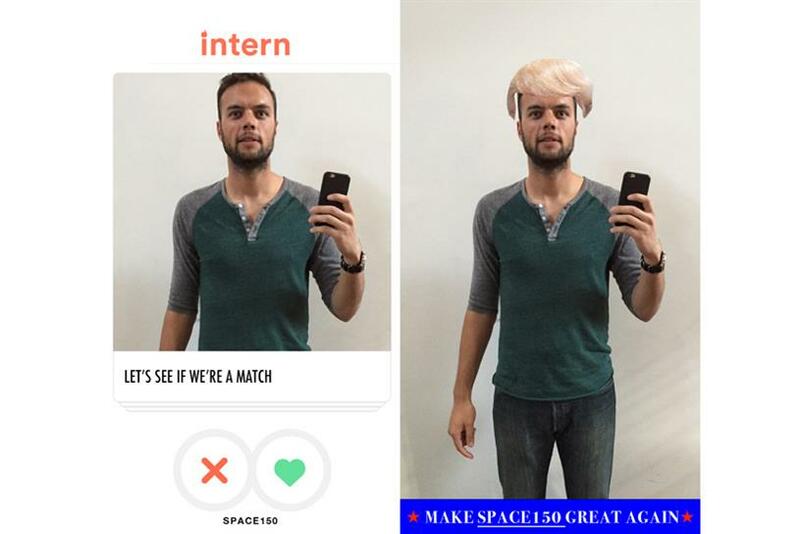 A Tinder-style filter says, "Let’s see if we’re a match," while one with Donald Trump hair says, "Make space150 great again." This is the first time the agency has dedicated the entire recruitment process to Snapchat. Greg Swan, vice president of social, public relations and emerging media, says the social-media platform is already a place where students connect with friends and influencers. For an agency that receives 100 applications for every open intern position, Snapchat makes it easier to find what Swan calls "thinkers, disrupters and visionaries." "Whereas using Twitter to recruit was a story in 2009," he says, "today's recruiting medium of choice for top social-minded candidates is Snapchat." Candidates are expected to create a "snap story" to promote one of space150’s clients, a list that includes Nike, Buffalo Wild Wings and American Express. But there’s a twist: the story should be targeted at audiences in the year 2020. The agency will review the stories after an April 10 deadline and top candidates will be interviewed for an annual program that begins in June. Swan says, "We wanted to cut through the traditional intern outreach and make something that captured attention and catalyzed candidates to spread the word for us."